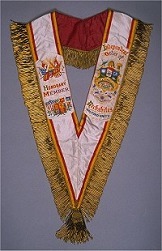 If a friendly society adopted sashes and aprons for its membership, it often then used neck-ribbons or collars to indicate officers. By the end of the 19th century ribbons had become very colourful. 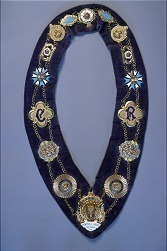 Frequently they bore machine embroidered heraldic panels and the name or initials of an officer's position. The images below are just some of the ribbons and collars that survive in collections across the Lothians and Fife, representing just a few of the hundreds of organisations and thousands of individuals that invested in these articles. Identifying the organisation underlying a ribbon can be difficult. Often the heraldic pattern is a clue. If it is not present the colour, the presence or absence of stripes, tassels and lettering all help to lead to the correct answer.